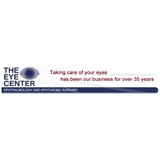 The Eye Center (Edison) - Book Appointment Online! The Eye Center is one of New Jersey's oldest and most respected Ophthalmology practices. At The Eye Center, we pride ourselves in providing quality eye care for the whole family in a professional, friendly environment. Our doctorsprovide routine eye exams and specialize in the treatment ofCataracts, Glaucoma, Diabetic Retinopathy as well as electiverefractive and cosmetic surgery. For your convenience, our three(3) state of the art facilities have evening and weekend hours as well as fully stocked optical and contact lens departments.